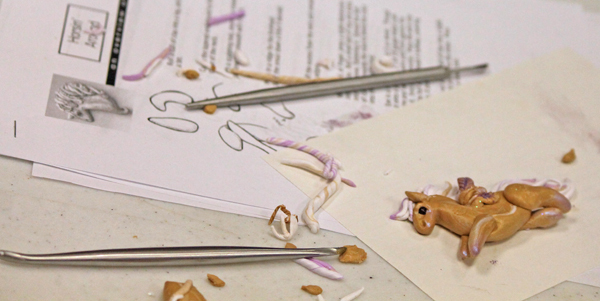 When I made plans to attend our annual ceramic artist gathering in Boise, I did not realize that my departing flight would fall the day after I was already scheduled to attend a bead making class with polymer clay artist Christi Friesen. 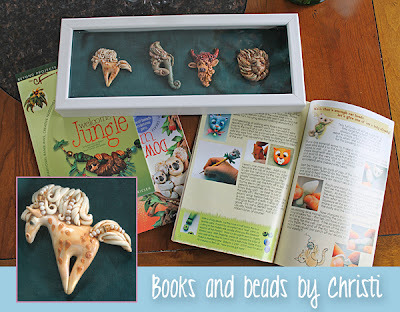 I have always enjoyed Christi’s fanciful beads, and am an even bigger fan of her colorful how-to books. Like my fellow ceramists, Christi a big believer in sharing ideas. She has a wonderful, conversational style in her books that is very appealing. 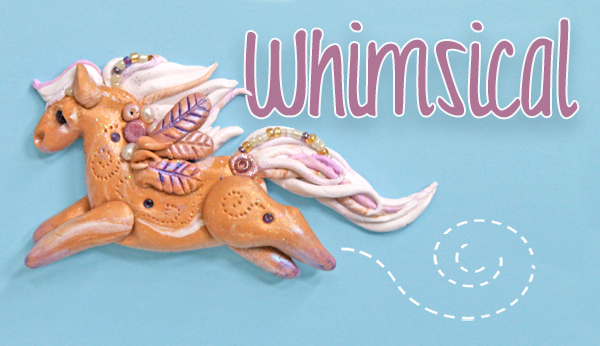 When I found that she would be offering classes at The Beaded Frog in nearby Greenville, SC, and that one of those classes would be making a pegasus bead, I knew I had to sign up. I have given Christi’s books (and beads) as gifts in the past. I think all of us working in the realistic art field benefit from loosening up and getting a little silly from time to time. It is a lot easier to take risks with something that is playful from the start. And Christi was nothing if not playful, as her pose for my picture (above) suggests. 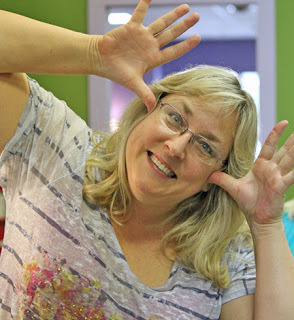 I also found her flexible, open-ended style of teaching her students to be very inspiring. 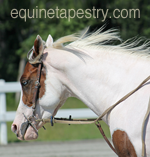 So instead of packing last minute items for Boise, I was making the pudgy palomino pegasus pictured at the top of this post. 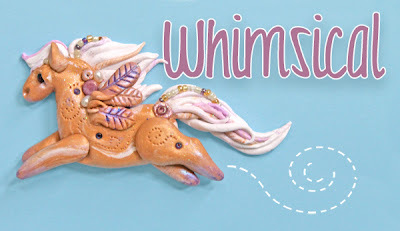 He was done in Christi’s style, since he was done by her instructions, but I’d love to explore a more whimsical style with some of my giftware in the future. And as with most ventures into unrelated artistic fields, I found quite a few things to take home for my own work. The lovely tools in the picture above are Christi’s design, and will fill a niche in my own studio. (You can see her full line and order them here. ) She also offers a product called Swellegant that is a metallic coating that can be painted on a surface and then given a patina. It looks like it might work better than fired lusters for things like bits and shoes. And finally, she was willing to tell me how she managed to publish such high-quality full color books for such a reasonable price. It made preparation for my trip a little hectic, but the class was the perfect start to a week spent in the company of other creative people! I leave for Bring Out Your Chinas in just a few days. Now that the presentation and the name tags are done, I am starting to get excited. Joanie and Addi have come up with a very different format for an equine collectibles gathering, and I cannot wait to see how it turns out. I know I am particularly interested in seeing how this guy turned out. He’s going to be one of the table centerpieces for our meals. Different ceramic artists are sending special centerpieces, which will be fun to see. I am going to try to post the different ones here. In fact, it is my hope that I’ll be able to do some live blogging from the event. If there is a reliable internet connection there at the convention center, I will try to send pictures and posts.